After confirming a sale, you may optionally choose to create a pro-forma invoice, detailing the content and terms for the sale. This provides an opportunity to provide the customer with deposit terms before actually raising an invoice. If you select Create pro-forma here, you will not be prompted to select your Invoicing methods. So you will need to make sure you do that later before you start shipping. 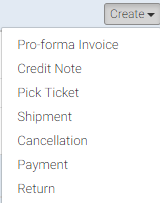 If you choose to "Just confirm" your order, you can always create a Pro-forma invoice from your "Create" drop-down menu in the top, right of your screen. Please note that pro-forma invoices in Stitchex do not behave like normal invoices. They do not have any affect on accounts receivable, cannot have payments or credits applied to them and are not exportable to Xero or other accounting systems. This is because a pro-forma invoice represents an offer or intention to trade and is always followed up by a "real" invoice (if the sale proceeds). For the same reason, pro-forma invoices are also not VAT invoices and cannot be used to reclaim VAT. Click the edit icon (pencil) next to "Shipping cost"
In the total rows beneath the order content, type the shipping cost. Then, your Proforma Invoice will automatically be updated to include the new shipping cost. Enter the shipping cost net of VAT/tax. Tax will be applied to the shipping cost at the level set on the sale overall. The shipping cost entered here will be used as the default shipping cost for any future invoice created for this sale.